What is Figures and Sums? If you run a small business and maintain manual records of all your transactions, Figures and Sums enables you to record these on your PC. 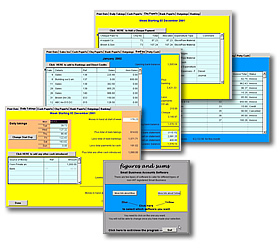 You can run Figures and Sums software on any PC with Microsoft Windows. Its easy to install and use - you dont need special training or computer help - just follow the instructions. To use it, you simply record every transaction - how much money your business has taken or spent in a day or any cheques you have received as payment for invoices. You enter the amounts in on-screen forms - Figures and Sums works out all the totals automatically and builds up a record - month by month or week-by-week - as you progress through the financial year. At the end of the year, you can print out reports and use them to work out your tax return or hand them over to your accountant to do it. Why use Figures and Sums? Because Figures and Sums maintains records as you go along, it takes away the headache of working out your accounts at the year end. Figures and Sums saves you time by working out totals automatically - all you do is enter the figures and print out the reports. Figures and Sums offers a quick and easy way to comply with the legal requirement to keep business records for income tax purposes. Who can use Figures and Sums? Yellow version - for "cash" businesses with daily sales and purchases often made with cash - suitable for small shops, hairdressers, driving instructors, market traders and similar businesses. Blue version - for "credit" businesses with invoiced sales and purchases made by cheque or petty cash - suitable for small manufacturers, importers, consultants, freelancers and similar businesses. You can try out Figures and Sums for free by downloading a trial version now - or call 0161 962 5656 to order by phone.